Phil Church: Why the decision to lower GCSE English grades must be overturned. Why the decision to lower GCSE English grades must be overturned. 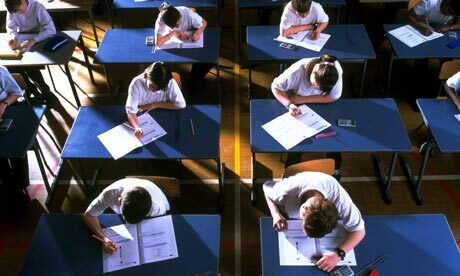 This week thousands of students were given lower grades in their English GCSE than they expected, which some people probably thought was a good thing, as it showed that at last someone was making GCSEs tougher and stopping kids leaving school with hundreds of A* grades and waltzing into sixth form colleges when in reality they can barely write their own name. Unfortunately, however sensible it might seem to make GCSEs more challenging, this was a terrible injustice. The English GCSE can be taken at two points in the year, January or June. In January of this year, students needed fewer points to get their grades than they did in June when the margins were raised significantly. Gaining a C grade in controlled assessment pieces required an additional three points out of forty, which meant that many students who had been told by their teachers to expect a C, suddenly found themselves with a D.
To give students different grades for pieces of work of the same quality in the same year of assessment is unfair, and also prejudice. What some people might not realise, especially the privileged people who make these decisions, is that the students who are most affected by this, the group we call the C/D borderline, have a raw deal as it is, and the last thing someone should be doing is making their lives more difficult. Teaching these students does not involve witty discussions on Shakespeare. They need constant reminders about how to use paragraphs, when to use complex sentences and how to identify and explain the use of adjectives. They are missing core English skills because quite often they are speaking a second language, or grew up in a household without any books in, or they have been through a series of foster homes, or suffered emotional and behavioural issues. Predominately, they are working class, and the last thing someone should be doing is ruining their chances of going to college and escaping unemployment because GCSE grades need to be lowered to show voters that exams are becoming more stringent. So, along with plenty of disappointed teenagers, I am hoping that in the next few weeks the Education Secretary, Ofqual and the exam boards make the right decision and forget about targets and politics and give these students the grades they deserve. Otherwise, they will be doing irreparable damage to the section of society that most needs their support and protection. Yes, but Phil, this is a pretty bizarre argument. You seem to be saying that these students should get a higher grade because they are poor, or socially disadvantaged, not because they meet the required standards of literacy. That can't be right. If you give out grades on those criteria you are patronising the students and deceiving the employers and higher education colleges. Should the driving test be made easier for learners who are unemployed or who come from single parent families? Of course not. English GCSE should be the same; you pass only if you have attained the skills and knowledge required, irrespective of your social background. I enjoyed your book but the guy in the pub had a point, you know! Unfortunately, if just achieving a C grade is the one thing that motivates a borderline student then changing the level of skill required after they've been assessed is not constructive at all. I agree that exams could be more challenging (or better designed) but this is something you set as a goal, at the beginning of the year for example. Many students had been given results in January and many of these have had results changed almost half a year on. One of the key reasons given for this change I have read is that there were too many C grades this year. Too many. We should be challenging the agenda that actively changes the boundaries of academic achievement based on some notion that the nation's students should only achieve certain grades in certain proportions. Personally, I think a lot could be done to drag many traditional subjects and ideas into relevance for the contemporary and future workplace. Changing grade boundaries in this way doesn't do anything for education or the future of our nation. The simple fact is that the boundaries should not have been changed mid year. This is not rocket science! It is a complete shambles, mismanaged by the ill-informed, headline hungry Gove. It is not to do with the fact that some students are 'poor' - it is the hours of parents evenings, after school sessions, weekend workshops that teacher and pupil have put in over the past year for much of it to be all ruled a waste of time in one simple swoop. It also makes for a very uncertain up coming year where teachers, parents and most importantly students will be progressing down a very bumpy road with little idea of the final outcome. I teach in a Special School. I'm already resigned to the fact that I shall never be classed as an Outstanding Teacher (boo hoo - like I care!) because OFSTED only award this grade to teachers who can show significant progress in their subject. I teach French to kids with poor memories. There is a STRONG rumour that all OFSTED inspections are routinely coming out a couple of grades lower than before and ye gods, some of the more cynical among us can't help wondering if the affected schools are going to be reinspected before the election and shown to be improving. Yes, the guy in the pub definitely DOES have a point, but so does the person who remarked that you don't grow carrots by pulling them up and inspecting the roots every other week. When I was on long-term supply in a Primary school I finally gave vent to my growing sense of the ridiculous, and told parents who were worried that their child couldn't read at 5, "If he was Swedish he wouldn't be in school for another two years2. What we are seeing is the result not just of Government bumbling over the years, CONstantly bringing in new initiatives when they promised they wouldn't, teachers struggling with ever-changing curricula etc etc, but more importantly, a cohort of children who have been schooled so hard, so young, that they never got the chance to play enough to allow their brains to be receptive to formal learning. I have two daughters. One learnt to read at 3, the other at 7. The first is now a Neuroscientist, the second teaches English to foreigners. They are both happy, can both speak English (and other languages) and both thank me regularly for having been allowed a childhood. I am really getting angry about the way we are deskilling our children at Being Children. Oh, and Man in Pub, why shouldn't ESOL speakers have the satisfaction of knowing that their years of hard work is to be fairly rewarded? If staff, children and parents ALL perceive that there has been a glitch in the marking, then it must be addressed. It's hard enough to motivate kids anyway!